From the 1340s to the 19th century, excluding two brief intervals in the 1360s and the 1420s, the kings and queens of England (and, later, of Great Britain) also claimed the throne of France. The claim dates from Edward III, who claimed the French throne in 1340 as the sororal nephew of the last direct Capetian, Charles IV. Edward and his heirs fought the Hundred Years' War to enforce this claim, and were briefly successful in the 1420s under Henry V and Henry VI, but the House of Valois, a cadet branch of the Capetian dynasty, was ultimately victorious and retained control of France. Despite this, English and British monarchs continued to prominently call themselves kings of France, and the French fleur-de-lis was included in the royal arms. This continued until 1801, by which time France no longer had any monarch, having become a republic. The Jacobite claimants, however, did not explicitly relinquish the claim. The title was first assumed in 1340 by Edward III of England, the Kingdom of England being ruled by the French Plantagenet dynasty at the time. Edward III claimed the throne of France after the death of his uncle Charles IV of France. At the time of Charles IV's death in 1328, Edward was his nearest male relative through Edward's mother Isabella of France. Since the election of Hugh Capet in 987, the French crown had always passed based on male-line relations (father to son until 1316). There was no precedent for someone succeeding to the French throne based on his maternal ancestry, nor had there been a need to. There had been no shortage of sons for more than three centuries from the inception of the House of Capet until the early 14th century, when new precedents concerning female inheritance finally had to be introduced. On the death of Philip IV the Fair's son Louis X in 1316, immediately followed by that of his son John I the Posthumous, it had to be decided whether his young daughter Joan or his brother Philip would succeed to the throne. Philip arranged for his coronation, and became Philip V of France. He was challenged by the supporters of the Princess Joan, daughter of Louis X, on the basis of his right to the throne. In response, he convened an assembly of prelates, barons, and burgesses at Paris, who acknowledged him as their lawful king, and declared that "Women do not succeed to the throne of France." This was later said to have been based on the 5th century Salic law, but it is now known that the Salic Law was only rediscovered later and used by the lawyers of the Valois kings to fortify their masters' title with an additional aura of authenticity. At the time of Charles's death in 1328, there was once again a dispute over the succession. Although it had come to be accepted that a woman could not possess the French throne in her own right, Edward III, the nephew of the deceased king and thus the nearest adult male relative, based his claim on the theory that a woman could transmit a right of inheritance to her son. This claim was rejected by French jurists under the principle Nemo plus juris ad alium transfere potest quam ipse habet (no one can transfer a greater right to another than he himself has), and the throne was given to the male line heir, Philip, Count of Valois, a first cousin of the deceased king. At the time, Edward paid homage to Philip VI for his Duchy of Aquitaine. In 1337, however, Edward, in his capacity as Duke of Aquitaine, refused to pay homage to Philip. The French king's response was to confiscate what was left of lands in English-held Aquitaine, namely Gascony, thus precipitating the Hundred Years' War and Edward's revival of his claim to the throne and title of King of France in 1340. The decision to assume the title of "King of France" was made at the solicitation of his Flemish allies, who had signed a treaty that they would no longer attack the French king. They said that if Edward took the French royal title, then the Flemish would be able to keep their honor, since they would not be attacking the "true King of France" (Edward III). Edward continued to use this title until the Treaty of Brétigny on 8 May 1360, when he abandoned his claims in return for substantial lands in France. After the resumption of hostilities between the English and the French in 1369, Edward resumed his claim and the title of King of France. His successors also used the title until the Treaty of Troyes on 21 May 1420, in which the English recognised Charles VI as King of France, but with his new son-in-law King Henry V of England as his heir (disinheriting Charles VI's son, the Dauphin Charles). Henry V then adopted the title Heir of France instead. Henry V and Charles VI died within two months of each other in 1422, and Henry V's infant son (Charles VI's grandson) Henry VI became King of France. He was the only English king who was de facto King of France, rather than using the style as a mere title of pretense. By 1429 Charles VII, with the support of Joan of Arc, had been crowned at Reims and begun to push the English out of northern France. In 1435, an end to the French civil war between Burgundians and Armagnacs allowed Charles to return to Paris the following year, and by 1453 the English had been driven out of their last strongholds in Normandy and Guyenne. The only French territory left to the English was Calais which they held until 1558. Nonetheless the kings and queens of England (and, later, of Great Britain) continued to claim the French throne for centuries, through the early modern period. The words "of France" was prominently included among their realms as listed in their titles and styles, and the French fleur-de-lys was included in the royal arms. This continued until 1801, by which time France had no monarch, having become a republic. Arms of Edward III, with the English lions and the French fleur-de-lys. Edward III, King of England (reigned, first term 24 January 1340 – 8 May 1360). Coat of arms of the kings of England after 1405, with the French quarterings updated to the modern French arms, three fleurs-de-lis on a blue field. Edward III, King of England (reigned, second term 1369 – 21 June 1377). Richard II, King of England (reigned 21 June 1377 – 29 September 1399). Henry IV, King of England (reigned 30 September 1399 – 20 March 1413). Henry V, King of England (reigned 20 March 1413 – 21 May 1420). Henry VI, King of England (term 31 August – 21 October 1422). Succeeded as King of France upon the death of Charles VI, according to the Treaty of Troyes. Henry VI, King of England (reigned, from England, 21 October 1422 – 4 March 1461; 31 October 1470 – 11 April 1471) was de jure king of France (although in reality only king of northern France) according to the Treaty of Troyes, ruling formally as Henry II of France (crowned at Paris, 16 December 1431). The English continued to hold significant portions of France until 1449, after which nearly all English-held territory was seized by his Capetian rival. That rival was the de facto king of southern France, Charles VII, who claimed the succession of his father in 1422, although he was not crowned until the recapture of Reims in 1429. After 1453, the only remaining English holding in France was Calais. 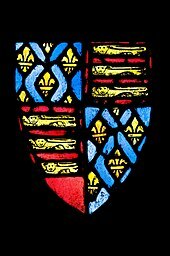 Henry, though deposed in England by Edward IV on 4 March 1461, continued to be recognised as king by supporters of the House of Lancaster, and was briefly restored to the English throne in 1470. Following a year-long episode of catatonia on the part of Henry VI of England in 1453 and the subsequent outbreak of the Wars of the Roses (1455–87), the English were no longer in any position to pursue their claim to the French throne and lost all their land on the continent, except for Calais. Edward IV of England (4 March 1461 – 30 October 1470; 11 April 1471 – 9 April 1483). Edward V of England (9 April – 25 June 1483). Richard III of England (26 June 1483 – 22 August 1485). Henry VII of England (22 August 1485 – 21 April 1509). Henry VIII of England (21 April 1509 – 28 January 1547). Edward VI of England (28 January 1547 – 6 July 1553). Lady Jane Grey (6/10 – 19 July 1553), de facto monarch. Mary I of England (19 July 1553 – 7 January 1558). Philip of England (jure uxoris; 25 July 1554 – 7 January 1558). Ill feeling between the two nations continued well into the 16th century. Calais was captured by French troops under Francis, Duke of Guise on 7 January 1558. Mary and Philip continued, however, to be styled Queen and King of France for the rest of her reign, as did Mary I's half-sister and successor Elizabeth I, despite her abandonment of her claims to Calais in the Treaty of Cateau-Cambrésis of 1559. Elizabeth I revived England's claims to Calais and took the French port of Le Havre in 1561. French forces ejected the English in 1563, and the Treaty of Troyes (1564), recognised French ownership of Calais, in return for payment to England of 120,000 crowns. Elizabeth died childless. Her successor was her cousin Mary, Queen of Scots’ son James VI of Scotland. The thrones of England and Scotland were joined in a dynastic union until 1707. The seven monarchs of this period continued to use the style King/Queen of France, though their claim was merely nominal. None of them was willing to engage in military campaigns for France against the actual Kings of France Henry IV, Louis XIII and Louis XIV of France. Indeed, Charles I married a sister of Louis XIII, and his son Charles II spent much of his exile during the Interregnum in France (at which time, even if not formally abandoning his claim for its throne, he certainly did not emphasise it). James I of England and VI of Scotland (24 March 1603 – 27 March 1625). Charles I of England and Scotland (27 March 1625 – 30 January 1649). Charles II of England and Scotland (30 January 1649 – 6 February 1685). James II of England and VII of Scotland (6 February 1685 – 12 February 1689). Mary II of England and Scotland (13 February 1689 – 28 December 1694). William III of England and II of Scotland (13 February 1689 – 8 March 1702). Anne of England and Scotland (8 March 1702 – 1 May 1707). Anne, Queen of Great Britain (1 May 1707 – 1 August 1714). George I of Great Britain (1 August 1714 – 11 June 1727). George II of Great Britain (11 June 1727 – 25 October 1760). George III of Great Britain (25 October 1760 – 31 December 1800). The French Revolution overthrew and abolished the monarchy on 21 September 1792 and replaced it with the French Republic. During the peace negotiations at the Conference of Lille, lasting from July to November 1797, the French delegates demanded that the King of Great Britain must abandon the title of King of France as a condition of peace. In 1800, the Act of Union joined the Kingdom of Great Britain with the Kingdom of Ireland to a new United Kingdom of Great Britain and Ireland. George III chose this opportunity to drop his claim to the now defunct French throne, whereupon the fleurs de lis, part of the coat of arms of all claimant Kings of France since the time of Edward III, was also removed from the British royal arms. Britain recognised the French Republic by the Treaty of Amiens of 1802. The change was not acknowledged by Jacobite claimant Cardinal Henry Benedict Stuart. He continued to formally style himself King of England, Scotland, France and Ireland until his death on 13 July 1807. Although the fleurs-de-lys were completely removed from the Royal coat of arms of the United Kingdom, they were later included in the arms of Canada, the British dominion, where they symbolise the heritage of the French Canadians, rather than the former British claim to the French throne. While the position of King of France was restored in 1814 (and later abolished for the final time in 1848) subsequent British monarchs did not pursue the claim to the French throne. James II and VII (12 February 1689 – 16 September 1701). James Francis Edward Stuart (16 September 1701 – 1 January 1766), styled James III and VIII, also known as the Chevalier de St. George or as the Old Pretender. Charles Edward Stuart (1 January 1766 – 31 January 1788), styled Charles III, also known as Bonnie Prince Charlie, the Young Chevalier, or as the Young Pretender. Henry Benedict Stuart (31 January 1788 – 13 July 1807), styled Henry IX and I.
James II for the last twelve years of his life and his son, the Old Pretender, until the Treaty of Utrecht in 1713, were actually pensioners of Louis XIV at the very time they were claiming his title. The Jacobite succession has continued since 1807 but none of the eight subsequent holders of the claims has actively pursued them. They continue to be customarily known as "King (or Queen) of France" by the Jacobites. Charles Emmanuel IV of Sardinia (13 July 1807 – 6 October 1819), descended from the youngest daughter of Charles I.
Victor Emmanuel I of Sardinia (6 October 1819 – 10 January 1824), his brother. Maria Beatrice, Princess of Sardinia and later by marriage Duchess of Modena (10 January 1824 – 15 September 1840), his daughter. Francis V, Duke of Modena (15 September 1840 – 20 November 1875), her son. Maria Theresia, Princess of Modena and later Queen consort of Bavaria (20 November 1875 – 3 February 1919), his niece. Rupprecht, Crown Prince of Bavaria (3 February 1919 – 2 August 1955), her son. Albrecht, Duke of Bavaria (2 August 1955 – 8 July 1996), his son. Franz, Duke of Bavaria (since 8 July 1996), his son. Prince Joseph Wenzel of Liechtenstein, born 24 May 1995 in London – the first heir in the Jacobite line born in the British Isles since James III and VIII, The Old Pretender, in 1688. In addition two failed claimants to the throne of England were also styled King of France. They are usually omitted from regnal lists. Lambert Simnel, impersonating Edward Plantagenet, 17th Earl of Warwick. Styled "Edward VI, King of England and France" (24 May – 16 June 1487). Captured in the Battle of Stoke Field by Henry VII. James Scott, 1st Duke of Monmouth. Styled "King of England, Scotland, France and Ireland" (20 June – 6 July 1685). Captured in the Battle of Sedgemoor by James II/VII. ^ Maclagan, Michael; Louda, Jiří (1981). Line of Succession: Heraldry of the Royal Families of Europe. London: Macdonald & Co. p. 17. ISBN 0-85613-276-4. ^ Taylor, Craig (2001), "The Salic Law and the Valois succession to the French crown", French History, 15 (4): 358–77, doi:10.1093/fh/15.4.358 . ^ Frieda, Leone (2003). Catherine de Medici: Renaissance Queen of France(first Harper Perennial edition 2006). Harper Perennial. p. 171. ^ "The Royal Arms of Canada – A Short History". Royal Heraldry Society of Canada. 7 July 2012. Retrieved 23 February 2013. Hubbard, Arnold (14 July 2003), How George III lost France: Or, Why Concessions Never Make Sense, Electric review: a High Tory online journal of politics, art and literature, archived from the original on 5 December 2008 .